Diamond certificates, or Certs, as they are known in the diamond industry, are often called the fifth C, in addition to the well-known 4Cs of diamond stones: carat weight, cut, color, and clarity. Why is buying a certified diamond better than buying a stone without a cert? What are the most reputable certification systems from around the world, and how are they different from each other? Are there different types of certificates and what are the key differences? How can you be sure that a certificate corresponds to a specific diamond? What’s the difference between certification and appraisal? A diamond certificate is the evaluation by a third-party, not by either the diamond buyer or seller. Unfortunately, an 3rd party certification is necessary, as it would be easy for an unscrupulous jeweller to take advantage of an uninformed buyer and sell him or her a stone, which ostensibly has much better characteristics than it really does. There are a number of ways unsuspecting buyers might land a bad deal. If the diamond is not certified, there is a good chance you may be buying a stone that is one or more grades below stated values in terms of carat weight, color, clarity, or cut. Without a certificate, issued by a reputable agency, such as GIA, AGS, or EGL, or HRD, a buyer relies on a jeweller’s integrity that the diamond’s 4C Parameters are accurate and not overstated. A lack of a certificate may be a clue that the diamond has been “enhanced” and the jeweller knows an inspection would reveal the diamond’s true condition, as well as indicate how the compromised diamond might erode. Internal fractures, inclusions, and excessively yellowish color, can be treated to visually improve the appearance of the stone. Such treatment deteriorates the overall quality and value of the stone. For example, diamond fractures can be filled with molten glass (a process known as Yehuda, named after the inventor’s name) to improve clarity by one or two grades. Or it can be worse: instead of molten glass, some jewellers use cheaper materials containing bromine to fill the fractures, which inevitably make the diamond darker over time, due to ultraviolet exposure. Some diamonds can be laser-treated to visually eliminate some of the “inclusions.” Laser treatment involves drilling tiny holes in the diamond to get to the inclusions. Needless to say, diamonds with drilled holes are worth less than comparable-grade diamonds that have no holes. Diamonds that are yellowish in color (color grades S through Z) can sometimes be pressure- and heat-treated to make them whiter (a Process often referred to as HPHT, high-pressure and high-temperature). Such treatment also makes diamonds more fragile and brittle and, therefore, more prone to damage. It is important to note that enhancement processes such as Yehuda, laser clarity enhancement, and HPHT can be useful for those who are looking to buy bigger diamonds for less money. If a diamond is inexpensive for its size due to yellowish color or if it contains a visible fracture, you can still buy such a diamond inexpensively (perhaps at a 30-50% discount compared to a naturally colorless or fracture less stone) and have it enhanced to improve its appearance. This enhancement would be significantly cheaper than buying a naturally higher grade diamond. The problem, however, is that some jewellers make such enhancements and try to sell those diamonds without disclosing to buyers anything about the treatment. To avoid buying a diamond “lemon” it is better to buy diamonds that are certified by reputable grading agencies. The key differences between the grading agencies are their diamond color and clarity grading systems, which might be somewhat difficult to compare against each other due to differences in scale. Over the years, however, some agencies made an effort to standardize their grading scales with that of GIA. Hence, be careful with older certificates, as the grades may not match current ones. For example, AGS modified its grading system in 1995. On this note, however, it is not advisable to buy diamonds with Certs that are more than three years old since diamonds, like everything else, are prone to wear and tear and over time can chip, scratch, or crack, and a certificate more than three years old is not going to reflect the accumulated everyday damage. The short answer is yes, there are a few types of certificates issued by the grading agencies’ laboratories. All grading labs have different names for their certificates, which help them differentiate their brands in the diamond market. GIA calls its certificates either a GIA Diamond Dossier or a GIA Diamond Report. AGS calls its certificates Diamond Quality Documents, Diamond Quality Reports, or Diamond Quality Analyses. All these certs are different in that they provide varying degrees of detail about a diamond. For instance a GIA Diamond Dossier comes in two types—with and without diamond cut details. All GIA Diamond Dossiers provide basic information on the diamonds’ 4Cs (carat weight, color, clarity, and two elements of the cut quality: polish and symmetry). Dossiers also specify the stone’s fluorescence and measurements. If the report comes with the “cut” information, it also provides detailed dimensions of the stone, such as table size, crown and pavilion angles, girdle thickness, etc. It indicates whether the diamond may need to be recertified when a 10x loupe examination confirms that some additional chips and scratches may have appeared on the stone that were not captured when the diamond certificate was created. 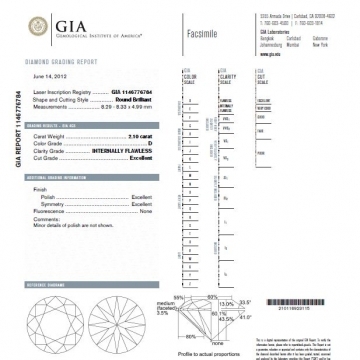 Below are examples of a GIA Diamond Report and a GIA Diamond Certificate (pictures are courtesy of GIA). Some diamonds are laser engraved with a serial number on the girdle, to match the serial number on the certificate. However, professional jewelry thieves know that a repolish of the girdle can eliminate the engraved number. And, of course, the same option is available to an unscrupulous jeweller. A better method to compare certification with a stone is to ask for a third-party’s professional evaluation. No matter how similar two diamonds may be, they are likely to vary in weight, measurements, angles, and proportions. Some certificates do not carry this level of detail, which is one of the reasons diamond stones with certain certifications are a little more expensive than others with less detailed Certs. If your certification offers this information, seek out an independent appraiser, a GG (graduate gemologist). An appraiser who does not sell or buy diamonds has no vested interest in your purchase and is likely to give you the most honest and accurate appraisal. If you cannot find an independent appraiser, go to a local jeweller and ask to make an appointment with an appraiser. Your odds of receiving a thorough, unhurried inspection improve with your method of approach—do not rush the jeweller, do not take the jeweller’s time away from potential other customers, expect to pay a fee, and be polite. If it improves your sense of accuracy, ask if you can have the evaluation without the GG viewing the certification. Then you at least know the GG did not simply copy what your cert says. Many things can be manipulated, but each diamond’s inclusions are unique. A certification that plots the diamond’s inclusions is like checking the fingerprints on identical twins—you’ll find the one you want. A diamond’s certification is a scientific review of the rock’s qualities: color, cut, clarity, and carat weight. It pertains to a loose diamond but will accompany the diamond even after a setting has been added. Certifications are conducted by several reputable groups. Certification does not assign a monetary value to a stone; it assigns grades on the diamond’s key qualities. An appraisal assigns a monetary value to a stone. Appraisals on loose stones are more accurate than appraisals on mounted diamonds, since flaws are less likely to be hidden. The appraisal of a diamond can vary, depending on who is conducting the appraisal, how, why, and when. An appraisal can be rendered useless by fluctuating market conditions, but a diamond’s certification is more steadfast. If a certified diamond has been mounted on a ring, it may need to be recertified to make sure normal everyday activity did not deteriorate the clarity of the stone by chipping or scratching the surface. Also, certain ring settings involve cutting into the stone or pounding on it, and recertification will provide an up-to-date evaluation.